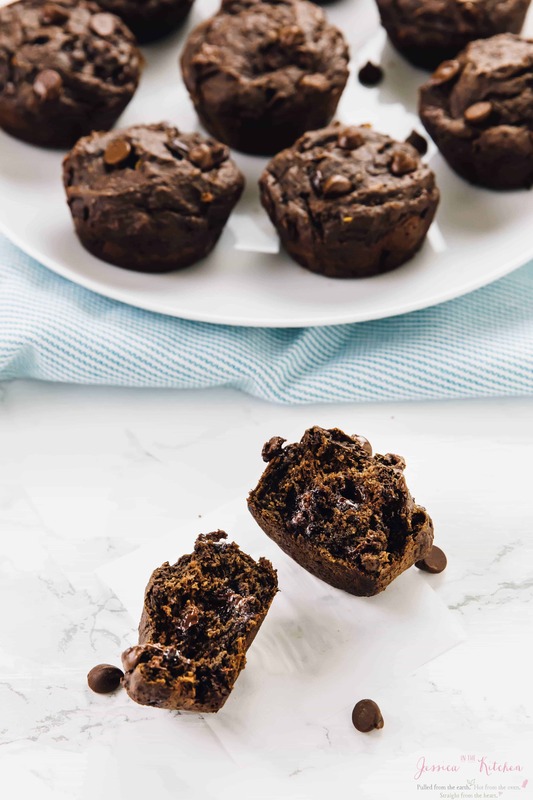 These Double Chocolate Banana Muffins are BURSTING with chocolate flavour! They are moist, soft and light, and taste absolutely delectable! 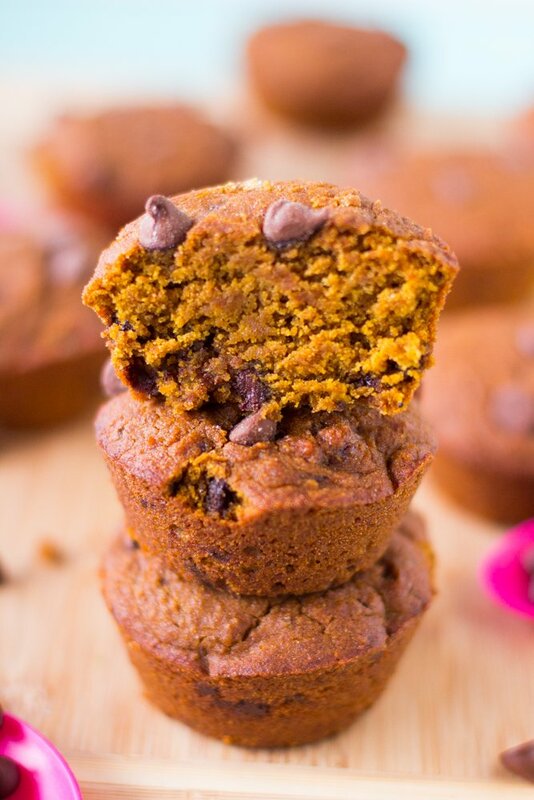 They’re also vegan, gluten free and healthier than your typical muffins! 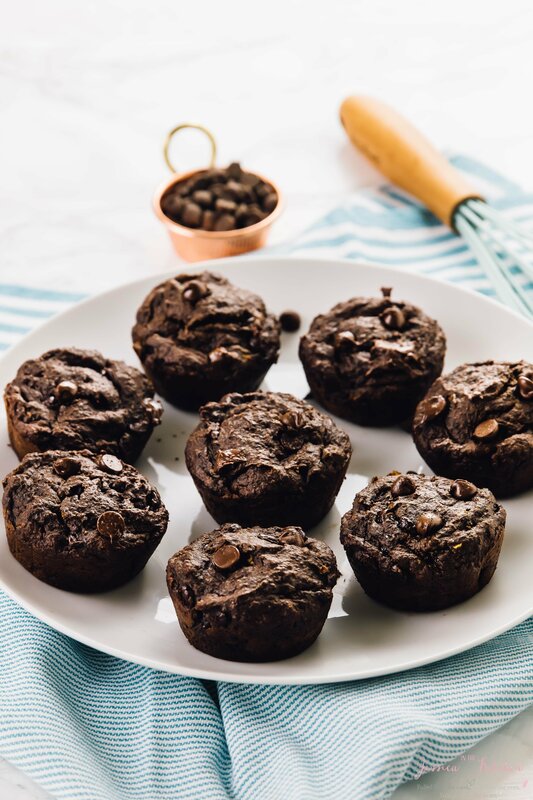 Fun fact: These double chocolate banana muffins (what a mouthful) will surprise you. It’ll be a pretty awesome surprise too – filled with “wait, these are vegan?” and “wait, these are gluten too?!“. The answers are still yes and yes. These babies took quite a few recipe testing, but the results are definitely worth it. Soft, moist, light and fluffy are only a few words to describe these muffins. 10 minutes of prep time is all it takes to get these into the oven, and onto your plate. By the way, I hope you had a great Valentine’s Day! I’m very aware that these would have been perfect, but I’ve been nursing a flu. The Mr. had it first (poor thing), passed it on to me the second he picked me up from the airport, and I’ve been a mini prisoner ever since. It’s been a while since I’ve been sick, and it still isn’t any fun. The Mr. ordered in fun, dessert, and a movie and we enjoyed Valentine’s from the comfort of our living room. Pretty perfect celebration for me, minus the flu of course. Also, I had these chocolate banana muffins to celebrate it too. After just a bit of recipe testing, lots of ripe bananas, and taking bits and pieces from my gluten free banana bread, these babies were born. I’ve completely transformed that recipe, which was already healthy, to make these even better. Lots of delicious chocolate flavour, and surprisingly, the banana flavour is pretty subtle. According to the Mr. it went from banana ??????? to oh, banana!???? Full disclosure, these questionable emoji choices are all my own, yes, I’m a total weirdo. Anyway, this is perfect if you aren’t too big on banana flavour because you really have to search for it, and even better if you’re a choco-holic like I am. One bite of these chocolate banana muffins, and you’ll definitely be hooked. 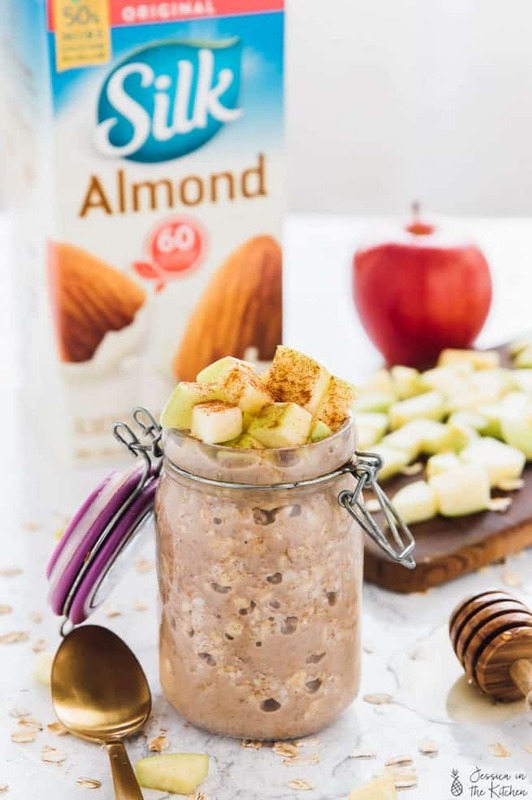 Perfect way to use up all those super ripe bananas in your home that’ll guarantee everyone will eat them. 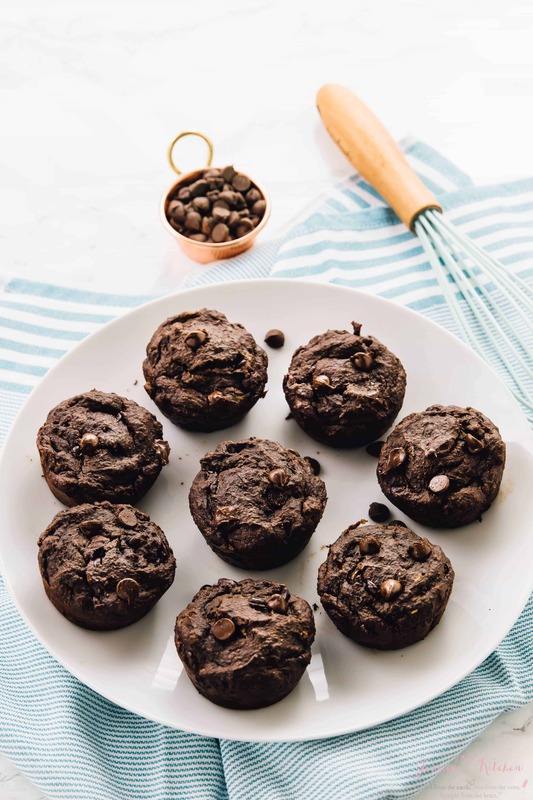 If you try these Double Chocolate Banana Muffins please let me know in the comment section below, or tag me on instagram with the hashtag #jessicainthekitchen! For more exclusive recipes follow me on Instagram AND on Snapchat: jessinkitchen. Preheat the oven to 350 degrees. Prepare a muffin tin or line with cupcake liners. 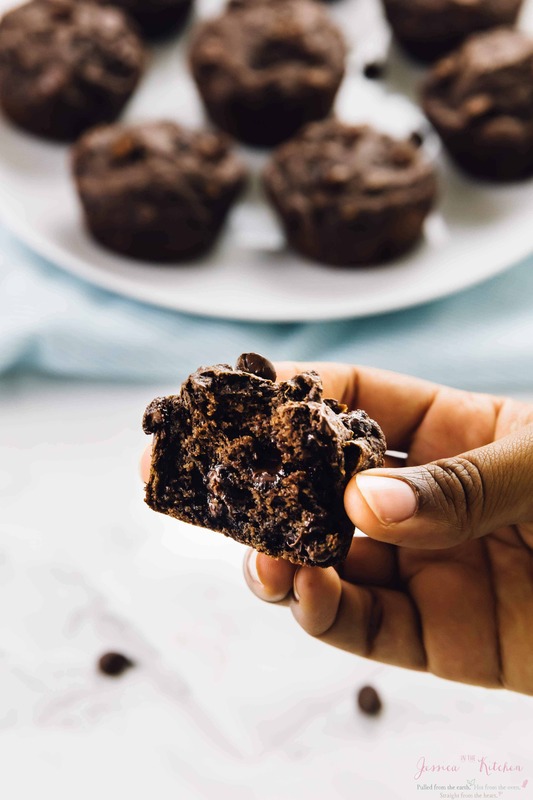 If preparing the actual tin, using parchment paper, rub the insides of a muffin tin holders lightly with coconut oil, then sift cocoa powder over to coat insides and shake off the excess in and on top of the tin. So essentially, flouring and buttering like you would a cake pan. Set aside. In a small bowl, whisk the flour mix, baking powder, baking soda, xanthan gum, sea salt and cocoa powder to combine. 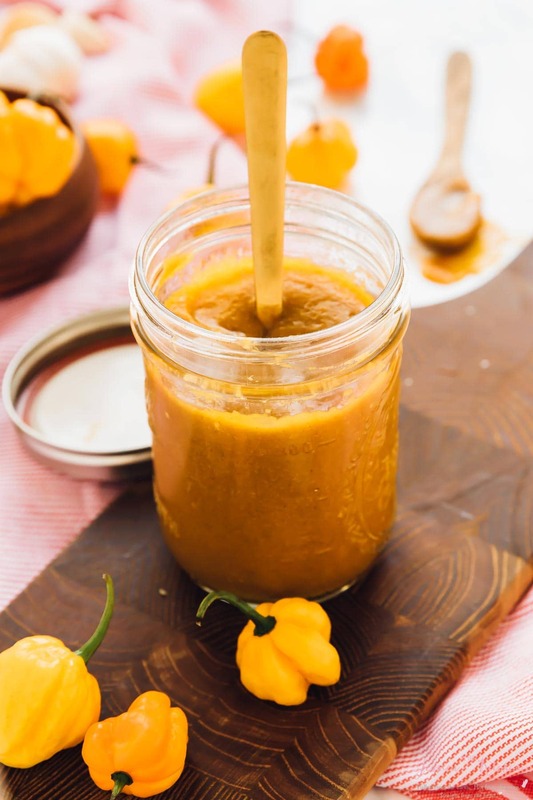 In a medium bowl, add the flax eggs, maple syrup and the coconut oil. Whisk together for about 1 minute until incorporated. Add the vanilla extract/bean, the mashed bananas and the almond milk. Mix together for about 1 minute until bananas are completely incorporated. Add the dry ingredients to the wet and mix again, scraping the sides and ensuring everything is combined. Do not over mix. Fold in the chocolate chips. The batter should be very thick. Spoon the batter into the muffin tin holders. I like to do 10 larger muffins, but you could also do 12 normal sized muffins. Add a few extra chocolate chips on top if you'd like, it makes them prettier! Bake the muffins for 20 to 23 minutes. I've done both times and prefer 23 minutes. Remove from oven and let cool for 5 minutes, then using a butter knife or a toothpick, slide around the edges of the muffins and remove. Place on a cooling rack to cool completely. Enjoy! These muffins are vegan and gluten free. *The calorie count will all depend on the type of chocolate chips you use. Dark chocolate is lowest in calories, and using stevia sweetened such as Lily’s Dark Chocolate Baking Chips will be the best choice, for example. You can also reduce to 1/2 cup chocolate chips if you’d like. Store these muffins in an airtight Tupperware container. They should last at least 4 days on your counter top before they begin to get harder. Awesome muffins, Jessica. Who would have thought these chocolate treats are healthy too? Thanks so much Angie!! Right?! Dont ya just love it when gluten-free baked goods are so fluffy and moist that they don’t taste gluten-free? These muffins look like a great companion for my coffee! The double the chocolate the better! Right?! I feel like I’ve won a prize when I accomplish that haha. Thanks Bethany!! I was wondering if I wanted to replace the maple syrup with honey would the recipe turn out the same way or not ? Honey is a bit thicker so maybe add another tablespoon of almond milk? If you try it let me know though! Just by looking at the photos I can tell your banana muffins are really delicious. And I love how they’re vegan and gluten-free too, I’ve been trying to eat healthier lately and your blog has helped me tons. Thank you so much! Thank you so much! I’m so glad my blog has been helping you! All the best and feel free to ask me any questions! I really want to make these but I’m allergic to oats, so could I substitute the gluten free flour Better Batter? Better Batter is the best gluten free flour I’ve ever used!!! I personally haven’t tried it, but I’m pretty sure that you could substitute! Check if your gluten free flour has xanthan gum, in which case you don’t have to add it into the recipe. I hope you enjoy!! Oh I forgot to mention that the Enjoy Life chocolate chips are dairy, nut and soy free and are amazing!!! Im just baking those after watching your video on fb, however my mix wasn’t tick it was soft so I’m hoping they come out good. I also didn’t have the xantham gym so I added a tablespoon of aquafaba maybe that’s why the mix was rick. I’m not sure that that substitute would work at all, but if it did, please let me know! I hope you enjoyed! Omg yum yum yum! My family and I LOVE these! My new favorite muffin recipe for bananas too old to eat. The chocolate chips add such a nice touch and they’re not too sweet (yay maple syrup!). Will be make these over and over again! Hi, Jessica. I made your Double Chocolate Banana Muffins last night. They taste divine, and were an absolute hit. Thank you for such an amazing and easy-to-make recipe. I look forward to trying some of your other recipes. With much gratitude and kindest regards. I just made these for my husband’s and my birthday 🎉 They are delicious! Thanks you Jessica! I used agave instead of maple syrup, and regular flour instead of gf (1/2 whole wheat/1/2 all purpose/plain flour and no xanthum). I’ll make the gf version when sharing with friends however. They hit that perfect point of the sweetness being just right. I made 8 in the larger American size muffin pans. I will be making these again for sure! Thanks so much for leaving your comment!! I’m SO glad you enjoyed again and thanks so much for your lovely feedback!! I hope you two had an amazing birthday!! Hi these look amazing! I try to be vegan and oil free . Do you think I can omit the oil? Maybe sub another flax egg? Oh I’m really not sure since I’ve not tested that! The oil really helps with moisture. I can’t guarantee it, but maybe another REALLY MOIST banana equivalent to that amount? I hope that helps and please let me know if you try it! These are delicious!! Thank you for this wonderful recipe!! My boyfriend and I have both gobbled down several of these since I baked them this morning. 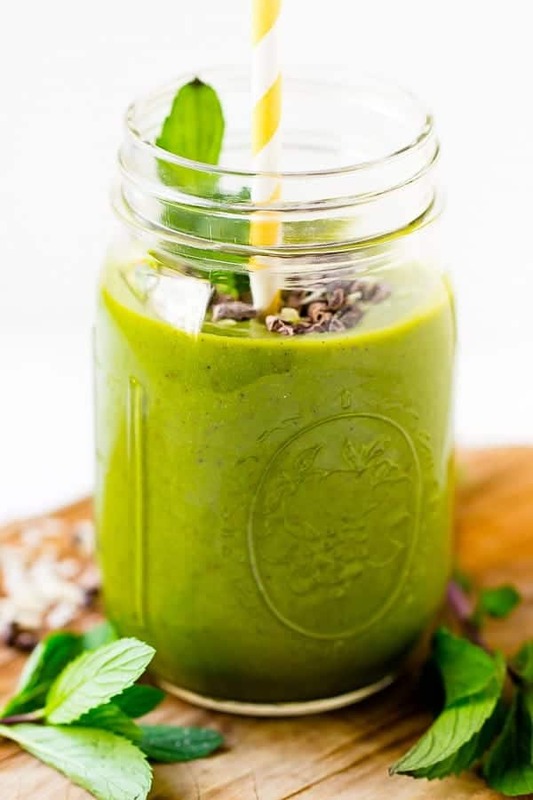 As I was putting the recipe together, I realized that I didn’t have any flax, so substituted it with 1 tbsp of Chia seeds soaked in 3 tbsp of water for 15 minutes and it worked beautifully. These are delicious and I’m thrilled to add another healthy vegan snack to my arsenal!! Thank you!! These muffins are easy to make, and taste absolutely divine! Every time I serve them, I am asked for the recipe. They are also my mother’s new go-to treat to have on hand. Thank you so very much! !